Home » Travel Tips » Hohenfels Germany: What can it offer you? If Hohenfels doesn’t have your heart yet through means of amazing people, opportunities to learn about the German culture and an Army Community that feels like family, then I have just one more last ditch effort to get you to fall in love with Hohenfels, like I, and so many others, have. Some people can only dream of eating Crepe’s under the eiffel tower, sipping wine in a back alley of Venice and lounging on a beach in Greece. But you? You get to be within arms reach of it all! However, some people CHOOSE to stay in their comfort zone of Post as opposed to taking a deep breath, embracing the unknowns and jumping into the beauty, the history and the culture of all that Europe has to offer. Therefore, traveling while stationed in Germany is a no-brainer, right? And Hohenfels Germany is in an AMAZING location for a jumping point to it all. Bavaria: You could not be in a more iconic spot for “Germany.” Afterall, Bavaria is the home of Oktoberfest, Liederhosen and where so many traditions have started that while you will enjoy any location in Germany, Bavaria is going to steal your heart. In fact, if you are nervous about traveling, don’t have your tourist passport or just don’t have the time and schedules to venture far out, you could spend your first year just going to amazing sites in Bavaria before even needing to explore other parts of Germany, let alone the rest of Europe! Hop over to the Czech Republic and take a beer bath (yes, a bath…in beer). Head south for two hours and you will be channeling your inner Maria Von Trapp in Salzburg as you sing to the Sound of Music in the Alps. Buy SO much Polish Pottery in Boleslawiec, for a fraction of the price it would take to accrue in the US…and then chow down on delicious perogies of course! 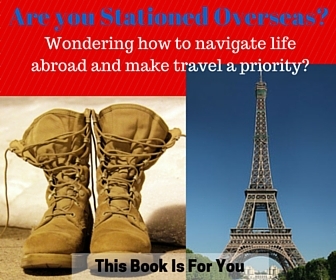 Take 5 or so hours and be in France, Italy, Switerland, Luxembourg or the Netherlands. Shoot, in my homestate of Nebraska, if I drive five hours, I’m still in Nebraska, still looking at the same boring corn that I saw 4 hours ago! Take off in any direction and in a matter of hours you’ll not only be in a whole new country but in a new and exciting place with delicious food, interesting cultures and stunning geographical features. The fact that in 6 years living in Hohenfels Germany we managed to explore over 40 countries and over 90 cities, it’s safe to say it is in a pretty prime travel location! Now, don’t get me wrong. I totally understand. 4) Children– traveling with kids can be stressful. But shoot, LIVING with kids is stressful in and of itself! Why not at least be somewhere amazing in the midst of it all!? Ok, I know, that’s easier said that done. If it’s not your teen rolling his eyes at one more museum then it’s your toddler throwing a royal fit because you are messing up her naptime. But trust me, even with the extra hassle of toting around the littles, you’ll forever regret not traveling during your time in Germany if you don’t jump on the opportunity. Even with a newborn in tow, we were able to travel to 5 countries and several cities within Germany before he even turned half a year old. Was it always easy? No. Did we always get a ton of sleep? No. Did I ever want to cry WITH him while he wailed on the plane. YES. Did I regret one single trip? HELL NO! While USAG Hohenfels is a special place with amazing people, it is actually the opportunities behind the gates of Post that made me fall in love with our time abroad. I have no doubt that you will encounter someone griping about how much they just haaaate Hohenfels. I encourage you to do one thing when you hear these complaints. Ahem…ONLY been able to go to Prague!? Do you know how many people would LOVE to stand on the St. Charles bridge!?!? Excuse me while I pull my eyes from the back of my head from the world’s longest, drawn out, dramatic eye roll. So, putting aside the slight fact that their pessimistic nature is clouding their opportunity to see how lucky they are with even their little jaunt to one of the world’s most arguably beautiful cities, but they are also not taking full advantage of traveling if that is the “only” place they’ve gone! Chances are, the people who “hate Hohenfels” have already decided they despise their life halfway around the world from their comforts of America. They have already committed to one of the many excuses (such as the above) on why they can’t travel as much as everyone else. And honestly, that is fine. Because you aren’t them. Nope, YOU are going to accept that sometimes, your husband has crappy schedules. You are going to brainstorm on how to pinch a penny here or there in order to save for a weekend getaway. And then guess what? You are going to go travel. You are going to make memories that will last a lifetime. You are going to experience cultures that will change you for the better forever. But most of all, you are going to fall in love with your time in Germany. If you are worried that money might be a deterrent for travel, start budgeting for travel NOW. It can be something as putting away $10 a month. By the time you get to Germany, that should be enough for at least a short weekend trip, if not more! Make a commitment that you WILL travel while in Germany. Pull up a google spreadsheet, an evernote or even just a good ‘ol trusty notebook and start writing down cities or even countries that you would LOVE to see in person. Need a little motivation? Follow us on Pinterest for ideas, suggestions and more. Join the BAWT (Bavarian Army Wife Travelers) group on Facebook to get inspiration or keep an eye on the Hohenfels MWR page for trips to take with a group if you are tentative to head out on your own. You will most likely get a USAEUR licence (the US Military licence that allows you to drive without taking the expensive, long and difficult German driver’s test). This will allow you to drive only in Germany. Therefore, if you plan on driving elsewhere, consider an international licence. If caught without one, it is one hefty fine…which will only take out of your future travel fund but put a damper on your trip! Don’t risk it. Note: You can get an international licence from AAA in the US, but this will only be valid for one year. If you get one locally in Germany, it will be good for up to 5 years. So, to help you out with number 3, I want to hear where you are aching to go? What will be YOUR first trip, near OR far, when you arrive to Germany? Make the commitment by letting me know in the comments.